Water mains require regular inspection, minor repairs, and the occasional replacement of damaged pipes and joins. The council departments and private companies that manage the water mains and water distribution networks know that regular maintenance is essential to ensure continuity of supply. They also understand just how important it is to be able to rely on a good van, large or small, to carry their engineers from one point in the network to another. Service work always has to be completed on site, whether this means working in a residential area, on a roadside or wherever the pipe network goes. Luckily, Syncro System installation centres are on hand to design custom storage and racking systems to meet the needs of water mains service engineers, and install them in all makes and models of van. For water mains operators and maintenance companies, having a van with a racking system customised to meet their own requirements represents a real advantage. A properly equipped van lets service teams complete their work more quickly on site, and move more easily from one job to another without having to sacrifice convenience. And a van fitted with customised, modular Syncro System racking is so much easier to work in, and lets you make full use of all available space. Syncro racking systems make it possible to transport in complete safety all the material, tools and equipment needed to repair pipes and inspection pits. The cabinets, drawers, component cases and containers in the Syncro System range are custom made from strong but lightweight materials and can be combined in various ways to match customer needs. Syncro storage units ensure that everything inside the van is kept tidy and in perfect order, and avoid engineers having to waste valuable time hunting for bits and pieces, parts and tools in the load compartment. 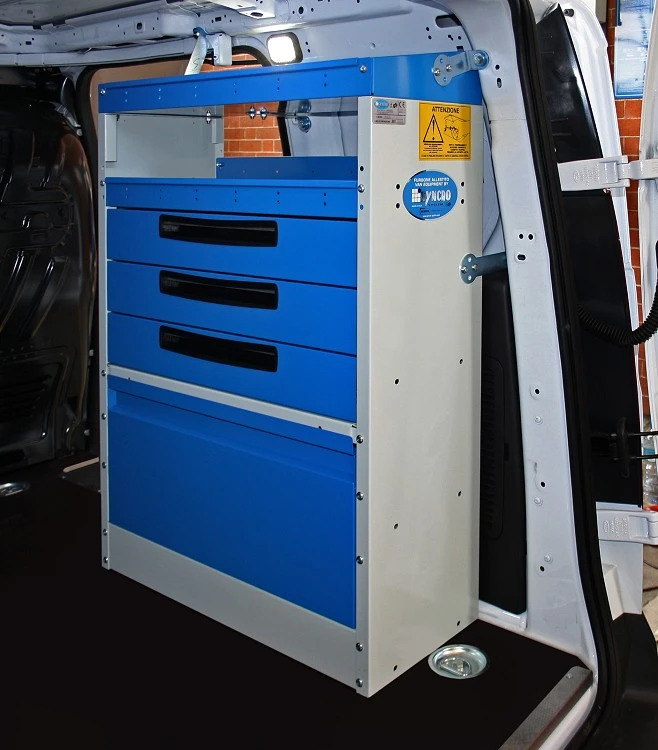 At Syncro System installation centres all around the world, any make and model of van (large or small) can be transformed into an efficient mobile workshop in next to no time. Upfits are fully customisable and are always designed on the basis of a detailed analysis of the customer’s needs. 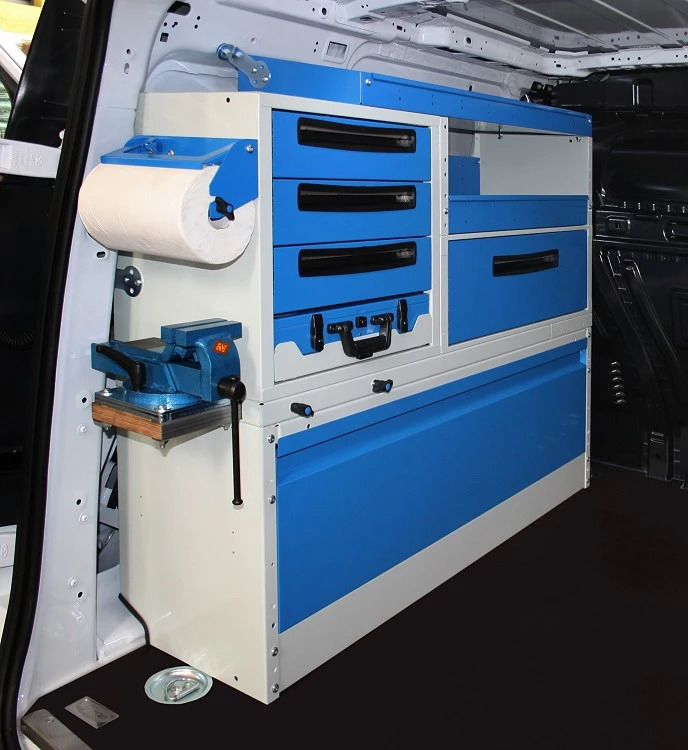 Syncro upfits include the installation of floors and linings to protect the van interior, the best storage units and accessories for the job, and efficient after-sales service and technical assistance when the job is done. 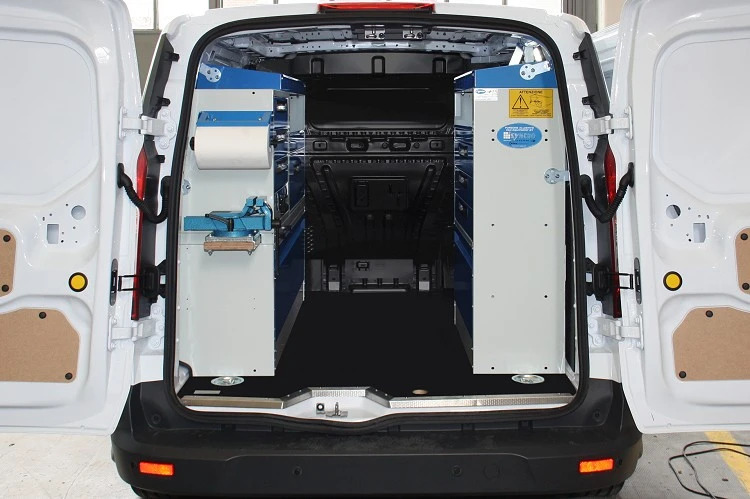 To see the load compartment of a van fitted with racking customised for a water mains service company , have a look at the gallery of images reproduced above. Syncro’s specialist installers fitted the van’s interior with custom storage units and installed tough floor and wall linings . The side and rear doors were lined with pre-cut panels to prevent scratching or denting the bodywork and the floor was reinforced with a panel of marine grade plywood with a non-slip surface to eliminate all risk of damage. The storage units themselves, all made by Syncro System from tough but lightweight materials, were then arranged along both sides of the van. On the left we can see a generous wheel arch cabinet with a metal door that serves as storage and as a base for the units on top. Above it are a set of drawers, component case cabinets and shelves as well as a highly practical pull-out vice support . The storage along the van's right is not so large but still consists of a closed wheel arch cabinet, a metal drawer unit and a set of shelves. This upfit for a water mains service company is completed by a paper roll holder on the left cabinets – an indispensable accessory for all kinds of work. Technicians specialising in the repair or replacement of water pipes and connections sometimes need to load bulky machinery into their vans. For them, Syncro System supplies a range of access ramps and steps in various sizes and load capacities. Syncro also makes and installs roof bars, roof racks and ladder racks, all robust but extremely silent at speed, to carry materials and equipment on the van roof.